BOSTON — Years from now, when they look back on their day at Fenway, Chris Carrara and Reid Fronk might not remember that the Indians defeated the Red Sox 7-6 in the finale of a four-game set, or that Shin-Soo Choo’s sixth inning grand slam proved the difference, or even that they saw famed Bo-Sox slugger Manny Ramirez record his 1,500th career RBI. Craig Hansen (Harwich '04) and Kyle Snyder (Chatham '98) meet All Stars and award plaques at home plate during pre game ceremonies. What they will recall – most likely with perfect clarity – is standing along the first base line, seeing their name and face appear on the centerfield Jumbotron, and hearing the thunderous roar of 36,557 strong that rang down from bleachers upon bleachers. Carrara and Reid, high school and Chatham A’s teammates, were just two of the 53 Cape Cod Baseball League All-Stars that were honored with glossy plaques and a pregame ceremony in which they were each individually introduced prior to Thursday’s game at the Fens. 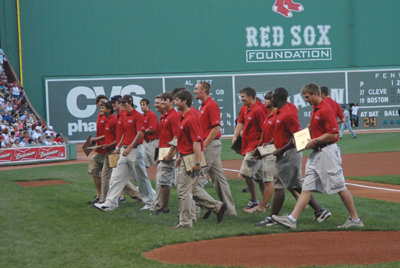 The act of honoring Cape Leaguers – the future major league stars of tomorrow – became an annual tradition at Fenway in the early 1990s. And while the evening’s festivities are nothing new to league officers, officials and field managers, it’s something truly remarkable to the throng of wide-eyed collegians. 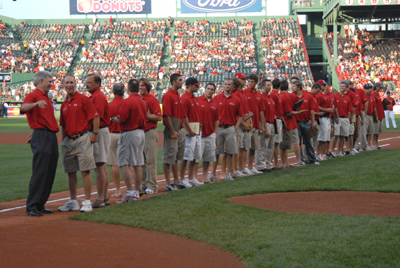 East CCBL All Stars recognized before the Red Sox vs Indians game on 3 August. Carrara, a standout second baseman at Winthrop, echoed that sentiment. “It’s just an honor to be here in this historic ball and watch a game. It’s just a great experience. It’s awesome,” he said. West CCBL All Stars with plagues after lining up along the third base line. Watching guys like Manny, David Ortiz and Travis Haftner take their caged hacks was perhaps the biggest thrill for the contingent of Cape Leaguers, and the irony of enthusiastically watching their idols spray balls to all sides of the field was not lost on Fronk. Such a sight was also invigorating amid a taxing summer season that’s involved few days off and multiple double headers. on the field during pre game batting practices. Pretty cool, indeed. And the odds are stacked in the Cape Leaguer’s favor. After all, one in every six major leagues made a six-week visit to the peninsula on their way to pro ball. But if the current group of Cape Leaguers wanted tangible proof that the league is truly a launching pad, they needed to look no further than the men that were handing them their commemorative plaques: former Harwich Mariners and current Sox closer Craig Hansen, and former Falmouth Commodores and current Sox second baseman Mark Loretta – the previous night’s hero who hit a walk-off, wall-ball double. 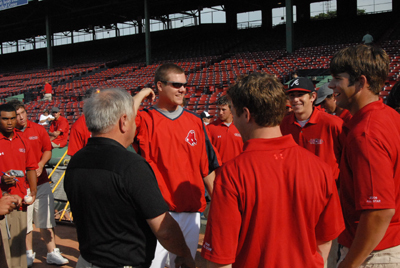 Jeremy Sowers (Cleveland Indians), (Wareham '02/'03) with Coach Cooper Farris and All Stars met just outside the Cleveland dugout during pre game practice. 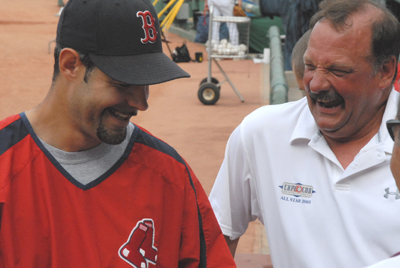 Sox third baseman Mike Lowell (Hyannis Mets) and first baseman Kevin Youkillis (Bourne Braves) are other Cape League alumns who were on hand and have gone on to distinguished pro careers. 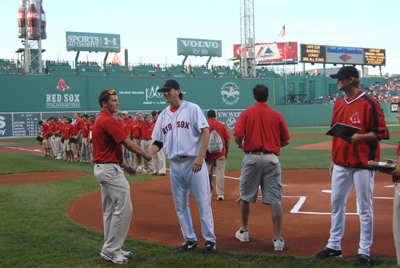 As have the Indians’ Casey Blake (Hyannis), Joe Inglett (Bourne) and Jeremy Sowers (Falmouth). 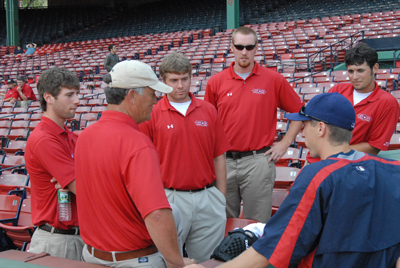 But it was Hansen, just two years removed from his summer stay on the Cape (in which he racked up 10 saves and 41 strikeouts in 22.2), who perhaps gave the most hope to the CCBL All-Stars and their shared dream of getting paid to play baseball. Hansen showed that not only can you make the jump from the Cape League to the major league – and rather quickly at that – but play an integral role, as he did against the Indians when he inherited a bases-loaded jam in the seventh and escaped by inducing a 6-4-3 double play that lifted the Fenway faithful from their seats. Carrara and Fronk, positioned in Section 38 in the right-center field bleachers, were among those who stood up and cheered.